One of them is the Natales Lepidus, commonly known as butterfly bat, given its fragile appearance, especially in males, with an average weight of 3 grams. The tiny species is in contrast with the so called Fisher (Noctilio Leporinus), one of the largest bats of the American tropics, reaching 13 centimeters long and between 40 and 70 grams of body mass. This “giant”, with a forearm between 77 and 88 millimetre long, feeds itself on fish and underwater invertebrates, specially in the interior waters of the so many caves of the territory, location of Santo Tomás Cave System, the largest of the country. An ideal shelter for many of the 27 species catalogued in Cuba of those chiropters is the underground habitat, where they form colonies of hundreds; to science one of the biggest concentrations of mammals all over the archipelago. 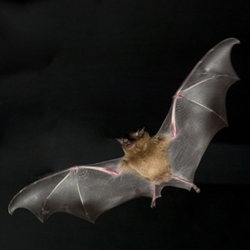 Stigmatized for transmitting histoplasmosis to human beings, bats have, in compensation, the virtue of acting as pollinators of plants and seed dispersers, while some others feed on insects and thus control plagues. One of the most outstanding characteristics of the terrestrial fauna of this island is its marked diversity in the population, shapes, colors and sizes, increasing to 16 thousand 553 typical species due to geographic isolation for its insularity.